Femto participates in the joint industry project ‘4D Fatigue’: a study on multiaxial fatigue in ships and offshore structures. When it comes to standard fatigue we know the methodology to calculate the lifecycle of ships and offshore structures. What we do not know is how the phenomenon of multiaxial fatigue speeds up the process of decline. To develop a greater understanding of this phenomenon, Femto Engineering and Delft University of Technology are developing a new methodology. Because of the continuous exposure of Ships and Offshore structures to the environment and operational loads, fatigue damage is an occurring effect to take seriously. For the industry’s working with ships and offshore constructions it is interesting to know when the fatigue damage associated with nucleating or growing fatigue cracks impairs the structural integrity to an unacceptable level. The 4D-Fatigue project focuses on the phenomenon of multiaxial fatigue in welded structural details. The TU Delft is developing fundamental knowledge on how to assess multiaxial fatigue in real, structural, welded joints of maritime structures that are subjected to real, multi-axial and non-proportional loading. The 4D Fatigue research project involves many participants and is supported by Femto Engineering. Currently, fatigue design of welded ship and offshore structures is predominantly based on test results from uniaxial and constant amplitude fatigue tests. Fatigue resistance data which is obtained from such fatigue tests is used in combination with a cycle counting method and damage accumulation hypothesis to determine the fatigue resistance of variable amplitude loading cases. However, the fatigue life estimates that are obtained with such an approach can be non-conservative for structural details having welds subjected to a multiaxial stress state, especially when stress components vary non-proportionally in time. 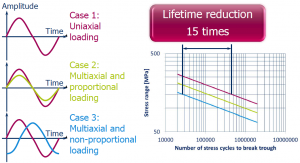 Numerous multiaxial fatigue assessment methods have been and are being developed to improve these fatigue life estimates but they lack sufficient validation. Femto’s numerical contribution to the multiaxial research incorporates modelling, analyzing, post-processing and implementing a new method to determine multiaxial fatigue. The research includes questions such as; how do we define the degree of multi-axial importance? and how to improve the statistical identification? To answer these questions Femto has modelled a maritime structure, applied loadings due to a confused sea state and made several tools to identify the hotspot areas. Femto’s main goal is to come to an implemented, easy to use, software tool that automatically calculates the degree of non-proportionality, multi-axiality and damage importance for each element in a complete model. At the TU Delft, a multiaxial testing facility will be built so that the fatigue resistance of welded details can be experimentally determined. The experimental data will be used in a comparative study in order to determine or develop a most adequate multiaxial fatigue assessment method of welded structural details under non-proportional variable amplitude loading. With this method it will be possible to estimate where and when fatigue damage becomes critical. The ultimate goal of the research is to have a tool available for the industry such that they not only can identify if multiaxial fatigue is of importance in their designs but also improve designs in general.